When I looked at the previous post on taking care of the black box, I realized that there were way too many words and concepts. It lacked an engineering elegance, so I set out to express it in a way we engineers can understand--equations and graphs. Before I even start, I want to clarify that the focus is on losing fat, not losing weight. Basically, we are all composed of fat, muscle, water, and everything else. We can think of "everything else" as a constant. Yes, bone density can change, organ size can change, but those are outside of the scope of this topic. Water weight can be lost and gained quickly by drinking water, eating, going to the bathroom, letting yourself get dehydrated, eating carbs. It can fluctuate by 5 or more pounds in a given day. We need a minimum level of hydration. We need to compensate for those changes. That leaves fat and muscle. In general, more muscle = good, more fat = bad, all within limits of course. So when we talk about losing weight, the focus needs to be on fat. You don't want to lose muscle, and water weight is not relevant. deltaE is simply calories in - calories out (be careful, it's not quite that simple though). lbs. body fat is weight * % body fat. 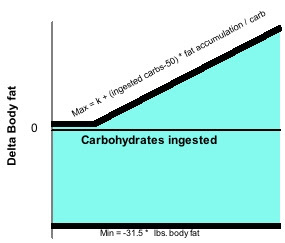 f (carbs in-50) is the slope of the upper limit on fat deposition related to the biochemical need of spent carbs in your system to store fat in your fat cells after allowing for 50 grams to fuel the brain. k is some amount of body fat that can be deposited even on a zero carb diet through alternate biochemical pathways. A recent paper called "A limit on the energy transfer rate from the human fat store in hypophagia" helps us begin to understand how much fat we can take off in a given day. This estimates the amount of energy that can be removed from fat to fuel your body. The answer is (290+/-25) kJ/kgd. This effectively sets a limit on the maximum amount of fat you can burn each day with moderate activity and no steroids. It may be possible to lose more fat with activity because of the hormones excreted by that activity, but it seems like a reasonable way to think about it. Note: As you lose body fat, the amount of fat you can lose in a day will decrease. Consider a 200 lb guy with 20% body fat. He is carrying 40 lbs of fat. So if he cuts his food intake by 1240 calories per day below basal metabolic rate, he can lose that much fat per day without eating into his muscle (lean body mass or LBM). Once he loses 10 lbs. of body fat, for example, he must limit his intake cut to 930 calories. Other metabolic changes are likely happening, for example, with cut in intake metabolism slows down, so that adjustment needs to be considered as well. The other day, I saw something on a blog. The author said something like, "If you're low carbin', calories aren't important. If you're low fattin', calories count." For the low carb-ingestion cases, you can gain weight by eating lots of calories, but your body adapts to the high calories by upping your metabolism and giving you a sense of high energy. Even though ingesting low-carb, you will put on fat through some alternative metabolic pathways. It's just not as fast. As you increase the amount of carbs that you eat. You open up a more efficient pathway for fat conversion. Your body uses the spent carbs to create triglyceride molecules. This is the primary storage form of fat. The slope of the line is a ratio of fat to carbs in a triglyceride molecule. I don't have that number. You all know how a ratchet wrench works. It has a gear and a pawl, which prevent the socket from moving backwards. Its analog in electronics is a diode and in plumbing a check valve. Simplified, biochemically you can store excess fat only if there are spent glucose molecules in your system. That is a well known, undisputed fact. So if you do not have spent glucose molecules, you can't store fat. Your body does not have a way to transport fats in your bloodstream into the fat cells. Your fat cells acts like a ratchet. It lets fat out if you are eating less than you burn, but if you eat more than you burn, your body has to find some other way to get rid of the fat (increasing your metabolism, fidgeting, pushing you out of your seat). This is why if you're not eating any carbs, calories don't matter much. At worst, no fat leaves the fat cells. You can't get fatter. What you lose is equal to what you eat minus what you burn. Burn more than you eat you lose weight; eat more than you burn you gain weight. E(out) = E(in) - deltaE. In fact, it is perhaps better to think of it as a giant feedback loop, because the calories you eat actually alter your metabolism as well over time. We as a society often see obese people and think that they have no willpower. They must be either pigs (gluttons) or lazy (sloths). But they are no different than any of us. When they feel hunger they eat, when they have energy they play. Let's think about this. People eat because a. they feel hungry or b. social pressures or pleasure. Hunger is not a character defect. We all know obese people who do not eat much, but stay obese anyway. What is the driver there? Something is altering the energy balance away from the balance that leaner people have. In general, if you don't feel hungry, you should not eat. Your body's cells do not need anything in that moment. If is likely that sustenance will be stored as fat. The key is to eat right so you don't feel hungry before you need the sustenance. When you eat carbohydrates, especially simple carbs like sugar, white rice, or white flour, your blood sugar increases. This causes your body to put out insulin to regulate blood sugar. It does this by pushing that sugar into your cells, where it can be used for fuel. At the end the spent glucose then allows for deposition of fat into fat cells. Now because the insulin has swept your blood clean of sugar, you begin to feel hungry. If you respond by eating carbs, the cycle starts again. The fundamental issue is that your body really wants to store carbs for later. Repeat this, as we tend to with a Standard American Diet (SAD), and your muscles become resistant to the effects of insulin. You need more and more sugar to fuel yourself. Your body has trouble using its fat stores for fuel. This drives deltaE up and therefore E(Out) down. You gain weight. You do not need carbohydrates to survive, your body will convert protein to sugar and use fat for fuel, but you want to ingest some carbohydrates to prevent the conversion of muscle into sugar (gluconeogenesis), as well as to prevent the feeling of foggy headedness that some people get when they eat low-carb. Lyle McDonald estimates a minimum of 50 - 100 g of carbs per day is good, more if you're doing resistance training. If you're on a low fat diet, it's different. In order to maintain your calories, you will likely be eating lots of carbs. This will then leave lots of spent carbs laying around in your bloodstream to hook up with those fatty acids. So if you are eating less than you're burning, you will lose weight. If you are eating more than you're burning, your body will push the excess into your fat cells. At the end of the day, if you are paying attention to your weight, you can, in theory, lose weight by simple willpower. Those who have hormonal and enzyme issues, such as insulin resistance will have a more difficult time of it unless they eat right. For most of us though, we do not obsess over every calorie or gram that we eat. So we need a more automatic method. For me, limiting carbs has been a pretty reasonable automatic method. I have felt stronger than I have before when limiting calories and so far have lost almost 40 pounds. But even with low carbs you have to eat mindfully. Eat only when you're hungry. Limit sweets. Pass up the cake at the company function. It's too easy to fall back into bad habits. Hi Tony. Great post. I saw a good example of the hormonal control of fat deposition on one of the Discovery channels. A woman had been severely obese for 16 years, the result of Cushing's disease. Cushing's disease is a small tumor on the pituitary, which ultimately increases secretion of the hormone cortisol. This in turn stimulates higher levels of insulin, and thus efficient fat storage. It was essentially impossible for her to lose weight, even on a starvation diet, a la the rats Taubes discusses in Good Calories, Bad Calories. They then moved on to an obese gentleman, who apparently "just ate too much". It never ceases to amaze me how people miss the obvious connection that hormones must somehow play into obesity. I was curious about the alternative pathway for fat deposition you mentioned. Is this an alternative to the LPL/insulin/alpha glycerol phosphate mechanism, or just the larger dietary carbs increase insulin scenario? Thanks Dave. Here are a few links that talk about ASP (Acylation Stimulating Protein) as an alternative pathway for fat storage. I can't vouch for any of the sources in particular, but there does seem to be something to it. Apparently it is not as efficient or effective as the LPL, AGP pathway. I know I say this all the time but your voice is SO DIFFERENT from mine that I love the, well, DIFFERENCE. ponder doing a thursday guest post? If it's true that the upper bound of fat loss is proportional to the amount of one's body fat, that would explain why weight loss tends to slow down as one loses weight. It also explains why the change in gradient is especially bad for us low carbers whose weight loss is (hopefully) primarily fat. Yeah, I think that's how it works and why fat loss tapers off. You could lose *weight* faster, but then you'd be losing the meat and not just the marbling. Regarding "his or her": Thanks. I struggle with that. It always seems like that breaks the flow of writing without adding information. However, if it is distracting to some, that's bad too. some people alternate his and her within the body of the text. Perhaps that would be a better solution? Thanks for the kind reply. I agree that one should attempt to avoid awkwardness in writing. I don't usually notice the his/her stuff. "My hope in this is that the reader gains insights that have a positive impact on his or her life." I have an idea for another post that I'd love for you to write. There seem to be quite a few people on the various low-carb forums who truly believe that calories don't count as long as they consume zero carbs. I disagree. I do believe, however, as you apparently do as well, that the way calories count is much more complicated than one might have thought. What prompted me to suggest a post is the funny/sad recent claim by a doctor that calories are only what is measured by burning in a calorimeter and since your body "utilizes" food rather than burning it, that is why calories don't matter. Hey SusanJ, I made the his or her change. I agree, it's especially important for an introductory note. Thanks again. That Dr. may be technically correct in some ways, but I think he's splitting hairs. He says we do not burn calories, we oxidize them. Well, burning is just fast oxidation. I can't say I understand the exact physics of this, but it seems that there is a lot of experience with the whole calories-in minus calories-out thing. I don't want to argue with some guy about technical/semantic issues around calories, but Lyle McDonald has some really nice posts on this issue. The first is "Is a calorie just a calorie" in which he argues that "fundamentally it is under strictly controlled artificial conditions. The third is "Metabolic rate - Overview"in which he discusses the calories out piece. I suspect that the reason low-carbs works for so many is the ratchet effect. If you eat zero carbs, there will be days where you eat less than you burn. Low carb makes this a little easier than a higher carb approach, i.e. you feel less hunger in general. So you lose weight on the low calorie days, then on the high cal days, you put on no or very little fat. I recently tried Lyle's Rapid Fat Loss diet. I was eating about 200 g of protein and little else every day. I never felt hungry. Towards the end of the week, as I went into ketosis I got a little shaky, but not hungry. I lost 7 lbs of fat in three weeks before going off it. I don't feel competent to post much more about the calories issue, but you gave me an idea about talk about how that graph in this post would change over time. The problem is increased carb intake makes room for efficient storage of dietary fat. At some point an extra calorie of dietary carb ends up allowing an extra calorie of dietary fat to be stored. That's why total calories are so important to folks on low fat plans. Energy from glucose can be used to create saturated fatty acids. This is a very inefficient process and if anyone claims that eating low fat has a metabloic advantage it is this inefficency they mean. Basically extra carbs eaten in combination with too little fat to store is very inefficient to turn into new fat for storage. The word triglyceride means fat. A triglyceride (fat) molecule is made by using a glycerol (the glyceride part) then bonding 3 fatty acids to it (the tri part). If you mean calorie for calorie, fat burns at about 10% calories from the glycerol. Two glycerols bind to form a glucose. And about 90% from the fatty acids. Fatty acids are burned into acetyl-CoA (aerobic) and/or ketones (varios metabolic paths). The reason it's "about" 90/10 is fatty acids have variable length. If you mean molecule for molecule once hydrolized into glucose and fatty acids the ration is 3 to 1/2 (in other words 6/1). This is molar ratio. I'm not exactly sure if you need calorie ratio or molar ration. I think you need calorie ratio. As to not being able to store new fat in the absence of dietary carbs, of course that's not quite true. It's actually not being able to store new fat in the absence of sufficient blood insulin. Thing is eating a serious excess of fat (think 2000 calories of dietary fat) can trigger insulin release. Also eating sufficient excess protein can also trigger insulin release. The amount of protein needed is lower than you'd want. The body needs something under 100 grams of protein per day. The rest of converted to glucose in a process that's a bit over 50% efficient per calorie. Eat 200 grams of protein in a day (at roughly 7 grams of protein isolate per ounce of lean meat so that's a lot of meat but not a vastly excessive amount) and you end up with the equivalent of 50 grams of dietary carbs. This is part of why Dr Atkins warned against combining low fat with low carb I suspect. So it's being in ketosis that's proof against storing new body fat rather than the easier to count low carb intake. Almost the same but it doesn't allow serious overeating. Your graph of new fat storage bottomed out at 0. I think it actually bottoms out somewhere below zero. That's why low carbing works for loss. Interesting to combine maximum fat loss rate (so many calories per existing pound of fat) with body fat percentage. It explains why heavier folks lose faster and lighter folks lose slower. Thanks Doug. These are great comments and clarifications. I want to clarify one thing though. You said, "Your graph of new fat storage bottomed out at 0. I think it actually bottoms out somewhere below zero. That's why low carbing works for loss." What I meant on the graph is that even eating low carb, if your total calories are high by eating a lot of protein or fat you can gain fat. The insulin release from eating lots of fat or protein that you mentioned could be one way, and there's also the ASP pathway. So the maximum fat gain is above zero when you are low carbing.